If you or someone you know has experienced tooth decay and is need of a permanent solution to this problem, the team at NYC Center 4 Dental Implants is here to help. Contact us and one of our friendly staff members will be in touch with you shortly. At the NYC Center for Dental Implants, our team of passionate, highly trained dental professionals is here to provide patients with the very best in dental care. We offer a wide array of services to ensure that everyone who walks through our doors gets the treatment they need in a timely fashion, for an affordable price. Along with providing implants restoration, extraction, temporary crowns, and implant supported dentures, we also offer all-on-four supported bridges. Read on to learn more! Dental implants are designed to support a full lower bridge with as little as four dental implants. This efficient procedure was developed in the ‘90’s, and has exploded in popularity since then. When we perform this service, we fix four implants on the anterior maxilla, which has strong bone density and allows for the highest success rate out there. Designed to support up to 14 prosthetic teeth, this procedure is particularly useful for patients that have experienced a significant amount of bone loss and tooth decay. Since only four implants are required, this surgery is not as invasive as other alternatives, and takes very little time to complete. Along with the speed and efficiency of the procedure, an implant supported bridge is also long-lasting, so you won’t have to come back to the dentist for repairs anytime soon. This surgery also makes it possible for patients to chew food with ease and smile wide, without any self-consciousness or insecurity. Since the bridge is durable and functional, you can go about your life without having to worry about any embarrassing accidents or inconveniences, like you’d find with dentures. If you would like to learn more about our implant-supported bridge treatment and all of the other services we provide, contact us and one of our friendly professionals will soon be in touch with you shortly! We look forward to improving your smile! At the NYC Center for Dental Implants, our team of highly trained dental professionals offers a wide array of services to ensure that our patients get efficient and long-lasting, top-notch care that they can rely on. Whether you need a single implant, a full set, implant supported dentures, temporary crows, or an implant-supported bridge,we are here to help you. An implant-supported bridge is a dental prosthesis that is supported by implants containing all teeth in one set. Unlike a typical denture set, this treatment provides added stability and functionality that you just can’t find anywhere else. Aesthetically, you can rest assured that the look of your face won’t be negatively impacted and you won’t have to deal with the perils of bone loss. You’ll be able to smile wide, eat anything you feel like, and never have to think twice about the security of your bridge. 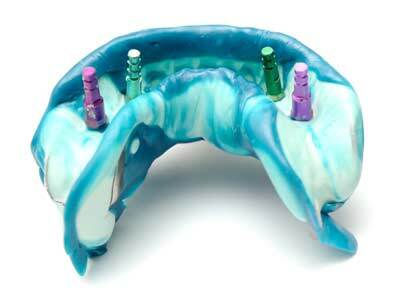 We can assure you, when you get an implant-supported bridge, it’s not going anywhere. 1 – The implant itself – this titanium part is inserted into the jawbone. Based on the size of your jaw, your dentist may choose to insert one implant per missing tooth, or skip a few. 2 – Abutment – (cylinder) – this part, made out of gold, porcelain, or titanium, is attached to the implant with a screw. 3 – Restoration (false teeth) – these porcelain crowns are connected to form the bridge and then fused to a metal structure that lies underneath. When an accident takes place and you find yourself in need of dental services immediately, the staff at NYC Center for Dental Implants is here to help you with all of your urgent dental needs. We offer implants, implant supported bridges, implant supported dentures, restoration, extractions, temporary crowns, and more, ensuring you can find what you need to restore your smile and feel confident again. Our restoration methods are designed to mimic the look and feel of your natural teeth, so you can feel comfortable talking, chewing, and sipping on whatever you want without having to worry about an embarrassing mishap or a painful accident. Our services are designed to stand the test of time so you can emerge from a dental emergency knowing that your new teeth aren’t going anywhere soon. If you are suffering from a severe tooth ache and require extraction immediately, we will make sure to first apply a numbing agent before carefully loosening the tooth in the gentlest manner possible. Whether you require local anesthesia, conscious sedation, or general anesthesia, we can determine which method will suit you best and allow for the shortest possible recovery time. Whether your tooth has been knocked out, you’ve lost a filling or a crown, are suffering from severe pain in your jaw or mouth, or feel sudden swelling come on, our staff of friendly, highly trained experts is here to guide you through this stressful time and get you back on your feet, feeling better than ever in no time. If you would like to learn more about all of the services we provide, we would love to hear from you. Contact us and one of our staff members will reach out to you soon! At the NYC Center for Dental Implants, we are committed to providing the highest quality dental care to each and every one of our patients. We know that the thought of visiting the dentist can send a chill up people’s spine, but it doesn’t have to be that way. When you come to us, we will provide you with an array of dental solutions that are cost-effective, efficient, and minimally invasive. One of our most popular and revolutionary treatments is known as the All-on-4 procedure. If you would like to learn more about this option, read on for answers to all your questions! What are the benefits of All-on-4? Along with being an efficient and permanent solution to your dental issues, this procedure prevents future bone loss in the jaw. By preserving the existing bone, you can maintain your facial structure and improve your oral health. Improving your smile can have a profound impact on your sense of self and overall confidence. We aim to help patients smile wider and brighter without having to worry about any issues with their new teeth. Unlike dentures and other non-permanent solutions, this treatment option is appealing to people who don’t want to manually remove their set nightly or worry about it slipping out at an inopportune time. Learn more about the differences between dentures and implants today. If you are currently struggling with severe dental issues that are impacting your day-to-day and hurting your self-esteem, now is the time to change all of that. Simply fill out this contact form and our staff will reach out to determine if All-on-4 is the right treatment option for your needs. We look forward to hearing from you soon! What does All-on-4 mean? This treatment provides patients with a full-arch prosthesis on four (hence the name) implants that are placed in the anterior maxilla. This concept was developed and analyzed back in the 1990s, and is now a common practice today. Who is a candidate for All-on-4? If you have tooth decay, broken teeth, gum disease, and other severe dental issues, you are likely a strong candidate for this procedure. What is the All-on-4 procedure like? This treatment, is at its core, designed to replace missing teeth and provide a permanent, same-day solution with the help of a bridge or denture. Whether you have issues with your upper or lower teeth, we will use only four implants to treat the issue. By using precise technology, we can get you in and out of our office with a new smile and minimal post-op downtime. NYC Center for Dental Implants offers cosmetic bonding services as part of our practice in Manhattan. Dental bonding is often used in cosmetic procedures, either as a standalone service or in combination with other treatments. Bonding refers to the use of a resin material that is then heated and cured to form a particular shape, fill in an area, or serve as an agent for another surface to adhere to permanently. There are two primary types of bonding you’ll see done in our practice; they are referred to as direct and indirect dental bonding. While bonding in general is used to repair damage or decay to your chipped teeth, there are two main forms of dental body: Indirect and direct bonding. Composite resin is used in both forms of bonding, but from there each form of bonding follows a different procedure. Direct dental bonding takes place when tooth colored fillings (composite restorations) are placed on the affected teeth so that they return to their original state (whether in size, shape, or color.) The direct dental bonds, as the name suggests, is placed directly on your tooth by our dentists and then shaped to look as aesthetically pleasing as possible before being left to “dry.” This form of bonding is preferred for teeth towards the front of your mouth, since they’re easiest to place and provide the most visually appealing final results. And since no lab appointment is required, the process happens much more quickly. For indirect dental bonding, there is a lab appointment required, where the fillings need to be created and then “dried.” We will need an impression of your teeth, which is used by the dental technician to make the bonding onto the replica (“indirectly”), before being sent back to your dentist for the dentist for the actual bonding. This process is used more commonly for teeth towards the back of your mouth to keep shrinking to a minimum, as well as for larger restorations. For more permanent, durable solutions, we may recommend other kinds of dental work, depending on the desired results. If you are interested in learning more about our cosmetic procedures, or you would like to know more about what is involved in a complete smile makeover, we’d love to hear from you. Contact our office today to schedule an appointment or a consultation. We’ll talk you through all the available options and help you set a course for treatment. You’ll be on your way to a new and improved smile in no time!